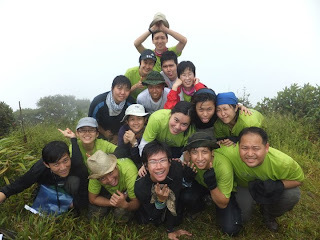 Our NYAA Journey: 4N3D Overseas Expedition/Camp 3. 2/6/11 - 6/6/11. Gunung Tapis Mountain Hike, 1512m altitude, 18th highest mountain of Malaysia. we left Singapore at 11pm for a 6 hour bus ride to Sungai Lembing, Kuantan. 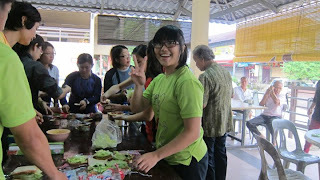 upon arrival at 6am, we had a hearty breakfast and prepared our running lunches. we reported to the local police station with our particulars, agenda, etc for safety's sake, and hopped onto 4 4-wheel drives to the base of Gunung Tapis. we reached the trail head at around 10am. setting off from the trail head, it took us just over 6 hours to hike to the camp site, reaching just at sunset. in a hurry, we rushed to pitch our tents and designate the kitchen, toilet, and restricted areas while there was still light. the terrain was extremely irregular, with mud slopes, rock surfaces, and multiple creek crossings. what made the trek even more tiring, was that it was not a straight climb up like Gunung Panti. instead, the route went up, down, left, down, right, up, down, right, up, and then down again. by 9pm, most of us were exhausted from the day's hike, so after half an hour of discussion, our camp chief decided to forgo the sunrise hike and set of only at 7am the next morning for the hike to the summit. 5 BOATers and YFFs stayed back at the campsite, as they thought the summit trail might be too hard for them. indeed, the terrain was harsh till the point i fell to the back of the group. normally, i'd be at the very front, skipping and singing my way to the top. this time, i was rushing to catch my breath, calming my muscles down along the easy stretches, then pushing my lung's limit again within 3 minute intervals. climbing the rock cliff to the summit and bonsai garden was no easy task either. my legs were too short to reach, to i had to jump quite a few times. thank God i did not slip, as the ledges were very narrow, and the erosion was quite bad. the summit view was not very spectacular, but it was a quaint site. there was an old collasped shelter, and you could see clouds and mist for miles. the bonsai garden had the best view yet, although we only managed to go just past the entrance before we had to turn back due to the rain. the whole of day 2 was filled with sudden short showers, starting when we took off our ponchos, and ending when we got it on. the trek down was no easy task either. it was definitely much more challenging then going up, especially since the terrain just down a lot more slippery, a few trees fell into the paths, and some loose rocks gave way. if my legs could not reach the next step before while going up, they had an even harder time stretching on the way down. the incline was so steep, my columbia trekking pants tore from knee to knee. good thing we were all wearing tights underneath. by the time we got back to the campsite, it was a couple of hours past nightfall. feeling cold and tired, i immediately went to sleep after dinner. the camp chief appointed me part of the "priority first class group", so together with 4 other BOATers and 3 YFFs, we went down the mountain 1 hour before everyone. however, around 1 hour before reaching the trail head, the main group caught up with us. at the designated pick-up spot, after playing around at the river in the rain for a couple of hours, the 4-wheel drives still had not made its way in to fetch us, so we had to hike out towards the river, where the 4-wheel drives would be waiting. halfway through the 1-2 hour hike, 2 4-wheel drives managed to cross the river to fetch us. we loaded our bags onto 1, and a few of us rode the other. due to the multiple showers on day 2 and 3, the river level we had to cross rose greatly, and even the 4-wheel drive i was on had difficulty crossing. those who weren't on the same vehicle as me had to cross the river on their own, with only a safety rope to hold onto. all of us finally made it to Lembing town at 9pm. we spent the 4th night of our camp travelling by bus back to Singapore, after a nice seafood dinner at Kuantan town. we only reach Singapore at 6am the following morning. 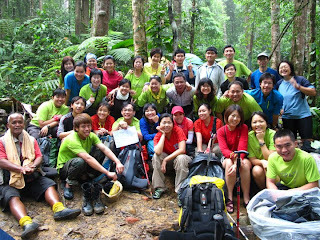 this concludes our 4N3D Gunung Tapis hike, from the 2/6/11 - 5/6/11. in total, i had 18 leech bites, multiple insect bites, cuts from sharp torns/leaves, and fell over 20 times. yet, it was an extremely fun trip due to the people around, and i felt extremely pampered, as everyone was worrying about me, offering me food, dry clothes, and constantly helping me up. after graduation from BOAT, i am going to miss everyone very much.